It is official; I do not like memorabilia cards. I have never been a fan, but over the last couple of weeks, I have come to the conclusion, that I genuinely do not like them. Two recent events have brought me to this conclusion. The first, was seeing some images on the Panini America Blog that pictured a number of hockey jerseys that had been cut-up, ahead of being added to cards that would be featured in the 2011-12 Prime Hockey. Now I am not a hockey fan, but my instant reaction was 'What a waste of a good jersey!' It seemed such a shame to see patches from a game-worn cut up and in my mind destroyed. 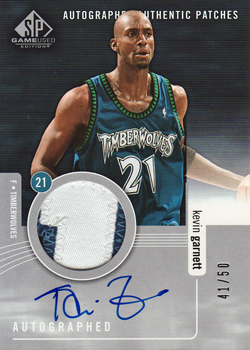 The second, occurred upon receiving the above 2004-05 SP Game Used Authentic Patches card of Kevin Garnett. I have made a conscious decision to increase the number of Kevin Garnett autograph cards that I have in my collection and was able to pick this one up from eBay for competitive price. It would be described by most collectors as having a good 2-colour patch, but as I held it in my a hand, I was completely unmoved. In fact I concluded that the card would look better without the patch. Now, I appreciate that amongst most modern day collectors, I am going to be in the minorty with the above view. But, the joy of the hobby, is that there is no right or wrong in determining what cards to collect. Consequently, with the exception of the existing sets that I am looking to complete, I will not be adding any more jersey / memorabilia cards to my collection.